Soon, your Owl will want to try the potty on her own. What times of day does her diaper usually need a change? Keep this in mind, as Owls tend to be fairly consistent and predictable in their pee and poop habits. 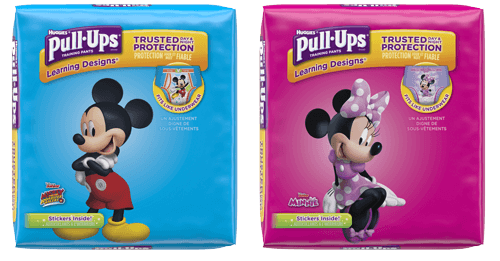 Introduce Pull-Ups® as their special potty training pants that will help them learn how the Big Kids do it. Little Owls like to be in charge, and Pull-Ups help them build skills by putting more of the potty training process into their hands. When your Owl is showing regular interest in the toileting process, it’s a good time to introduce him to Pull-Ups. Your fastidious Owl is likely to know when he has deposited any poop or pee into his Pull-Ups, so he may enjoy the Pull-Ups® Learning Designs® style. These show how the designs have disappeared and confirm his suspicions that he needs a change. “You can pull your Pull-Ups on and off just like we practiced with your pants. You’ll wear them instead of a diaper. When you feel like you get that tight feeling in your belly, just tell me and we’ll go to the bathroom and practice putting your pee and poop in the potty. Would you like to try your new Pull-Ups on now?” If your child says yes, take advantage of the opportunity and ask if she’d like to try to go on the potty before she puts on her new Pull-Ups. Pulling pants up and down is an important skill that builds independence — for potty training and beyond. It’s also something Owls like to practice, and it helps them get ready for using Pull-Ups. Make sure your child has pants with an elastic waistband, and give opportunities throughout each day to practice this skill. Gentle repetition will comfort your Owl and help him feel more confident in the potty training process.